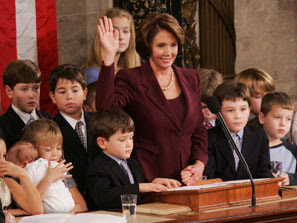 “Pelosi’s a particularly tough demographic to demonize,” says a senior Republican strategist who has okayed several anti-Pelosi ads during the 2006 campaign. I've long wanted to have Nancy play 'bad cop,' ramming progressive legislation through the house so that Obama ends up looking relatively moderate (and so that the inevitable Collins/Snowe/Nelson crappification of everything in the Senate still results in good legislation). With Republicans admitting that they can't get anything to stick to her, the case for this sort of strategy only looks stronger. I guess demonizing grandmothers isn't such a hot strategy after all.